Bedrock's most famous family as audiences first fell in love with them! In Season Five, the Flintstones and Rubbles still delight young and old with prehistoric versions of modern conveniences and modern predicaments. Over 26 episodes on 4 discs, the two families travel in a time machine, tangle with jewel thieves, spies and celebrity cops and get caught in a handful of show-business fiascos. Usually at stage center, fathead Fred is menaced by a mad scientist, joins a rodeo, takes flying lessons, impersonates royalty and plays Santa Claus in a really big way. Pebbles and Bamm-Bamm grow bigger and cuter - and the rivalry between their parents over who's Bedrock's Most Beautiful Baby causes a temporary rift. With each season of The Flintstones, the quality becomes lower and lower. As much as I love the series, I admit I go into Season Five with some trepidation. How much wheat and how much chaff will appear here? Read on to discover my thoughts! I’ll examine each of these 26 programs in the way presented on the DVDs, which also corresponds to their airdates. The “P#” after the title relates the episode’s place in the production order; for example, “P2” was the second program completed. 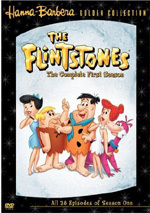 The synopses come from a site called “The Flintstones and Hanna-Barbera” (http://www.topthat.net/webrock) - thanks to them for their permission to use the recaps. I think that when a series adds new characters, it usually smacks of desperation. 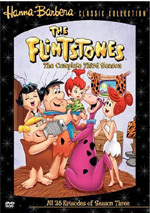 The Flintstones brought in many new components over Seasons Three through Five. Hoppy is just the first of a few; we’ll see plenty more gimmicks to provide new ideas for the writers. At least Hoppy is a fairly painless addition and not one who feels especially forced. He gives Dino a pal and his kangaroo connection makes him unusual. “Happy” itself is a pretty amusing episode. I do love the scene in which Fred challenges an angry Dino to bite the hand that feeds him. When my dogs act like ingrates, I occasionally perform the same action. Happily, to date they have yet to chomp on my mitt. It tosses in more than enough additional laughs to become a positive start to Season Five. Note that “Happy” provides a change in the main voice cast. Instead of Bea Benaderet, Gerry Johnson now plays Betty. Funny – I don’t recall ever noticing this shift in the past, but as soon as I heard Betty here, I realized a change had come. I guess this seems more obvious since I’ve watched all the shows season by season. I don’t know why, but something about the sight of Fred’s voice coming from Dino’s mouth amuses me. That’s the point, of course, and the show manages to become reasonably entertaining. It boasts an asinine concept but provokes some fun moments. Trivia note: “Monster Fred” marks the series’ first allusion to the Beatles. Here they’re called “The Beagles”, though they’ll pop up in other guises in the future. As you can tell with this episode and “Monster Fred”, Season Five finds us with more and more unrealistic concepts for The Flintstones. While “Monster” wasn’t very good, “Bitty” proves much more entertaining. Some of that comes from the amusing jabs Ed Sullystone pokes at Dummy Fred, and some of it simply stems from the lameness of the ventriloquist routine. Overall, I like this episode quite a lot; it’s one of Season Five’s best. “Party” takes easy laughs from its situations but they’re fairly good laughs at least. It derives all its humor from the mix-ups and milks them for all they’re worth. The show doesn’t feature a memorable premise, but it works. After the minor highs of “Party” we go to a dull episode. I’m with Fred here – Bony’s an annoying character, and I feel bad for our hero since no one else understands why he feels threatened by Bony’s presence. Cripes – Pebbles calls him “Da-da” and everyone thinks Fred’s being unreasonable? His friends and family abandon Fred awfully easily in this lackluster program. While the last two episodes stayed within realm of reality, we go back to fantasy with “Cinderellastone”. I figured this wouldn’t be a good show because I maintained absolutely no memory of it; I’ve seen it a number of times, but the plot synopsis didn’t jog any recollections. When I watched the show, I remembered it. That reminded me why I couldn’t recall it in the first place: it’s decidedly forgettable. It takes Fred into the Cinderella story with sporadically amusing results. There’s not much here to make this a good program. Unlike “Cinderellastone”, I possess strong memories of “Home”. In fact, I think I even wrote a little story based on it back in second or third grade, as I know I really liked it at that time. However, it’s not aged particularly well. The concept of having to spend a night in a haunted house was tired back in 1964, and the theme hasn’t gotten fresher over the last 40 years. This is a watchable episode but no better than that. Hoo boy – the fantasy elements are getting heavy! I don’t like the Flintstones episodes that fall into the thriller/action genre, and this James Bond parody falls flat. It rambles on and on without ever becoming interesting. Except for a couple of mildly funny bits, this one’s a dud. After a spoof of James Bond, we head to a Munsters/Addams Family parody. The Gruesomes aren’t terribly memorable characters. They feel like the gimmicks they are and this introduction to them is mediocre at best. I don’t like the Gruesomes or this silly program. Trivia note: “Gruesomes” offers a very rare episode in which the pre-credit sequence doesn’t simply act as a teaser for a scene yet to come. This part is original and doesn’t repeat later. Wow – a show that doesn’t indulge a fantasy element! The return to a realistic concept makes this program an improvement over its immediate predecessors, but don’t expect miracles. It derives good moments from the battle between Fred and Barney and seems mostly good. I can’t classify it as anything particularly strong, though. The Flintstones stays in the realm of relative reality here. Sure, the love affair between the two animals clearly exaggerates actual behavior – it’s not like this is a documentary – but at least it doesn’t involve monsters or supernatural elements. Loudrock is a moderately interesting new character, and shows that focus on Dino are usually fun. We’ve already seen this story, as Season One’s “The Tycoon” followed a similar path. Does “King” offer any new twists? Not really. I can’t call it a literal remake of “Tycoon”, but it doesn’t stand out as particularly fresh. It’s entertaining but still little more than a rehash of an existing show. One of Season Five’s best shows, “500” offers a memorable running line about how Fred drives like a man coming home on the freeway. It’s a simple tale but the racing theme derives a lot of good humor. Wow – two straight solid programs! That’s a real feat for Season Five. This one digs into some juicy references to other sea-related pieces, and it gets out a number of funny bits. It stands as a winner, especially when Barney misspells his smoke signal. Now we head back to a not-too-hot show. Leaving aside the oddness of a Christmas episode on a series that takes place BC, this one suffers from the sappy tone that infects many holiday programs. It’s a cute show at best. “Lesson” falls in between the good Season Five programs and the crappy ones. Actually, it falls closer to the “good” side, as it has a few nice moments. I like Fred’s reverse psychology when he avoids Wilma’s nagging, and the flying scenes have some funny bits. It’s not a classic, but it’s above average for this year. The Flintstones likes its wacky caper episodes, and “Car” comes in that category. This isn’t a fresh concept for the series, and nothing about “Car” makes it overcome its tired theme. I like some of the parts before the gangsters get involved, but after that, the show falters. Back to the fantasy! “Machine” acts as one of the better episodes in its genre. Sure, it’s intensely gimmicky, but it musters decent comedy as the characters zip through the centuries. “Gruesomes” is a silly show but acts as a likeable one. Much of the fun comes from its quotable moments. I love how Jethro says “you mean that?” whenever Fred makes disingenuous statements about how he wishes the family could stay. Add to that the funny Beatles spoof with the Four Insects and their hilariously crappy song and this program stands out as a good one. “Sheriff” isn’t as much a fantasy as something like “Time Machine”, but it sure departs the normal sense of reality. It offers a minor spoof of High Noon and provokes a couple of minor laughs. Still, it doesn’t become anything special or particularly memorable. Two consecutive Western-themed episodes is probably two too many. Fred and Barney’s impersonation of a cowasaurus has its moments, though even those feel like they’re recycled from the costume party episode of a few seasons ago. Other than the return of Uncle Tex, this is a lackluster show. Continuity alert: what gender is Hoppy? Just a couple of shows ago Betty referred to the critter as “she”. However, here Betty calls the pet “he”. What’s the deal? Another episode that smacks of creative desperation, “Caper” is just another excuse to put Fred and Barney into a wild situation. It includes some mildly amusing cracks at the expense of detective series but never quite ignites and becomes tedious. The lack of reality makes this a less than stellar program. I like the parts of the show in which Fred tries to be a hero for Pebbles and make a few bucks, but I don’t care for the inclusion of yet another threatening plot. The program would work better if it stayed in the realm of reality; the detour into the problems with the crooks just gets dopey. I feel like a broken record as I constantly harp on these elements through Season Five, but they cause a number of problems. “Hercurock” offers another retread episode. Fred has gone Hollywood a number of times in the past, and this isn’t even the first show to cast him in physically grueling roles. In fact, it’s the third after Season One’s “The Monster from the Tar Pits” and Season Three’s “Hawaiian Escapade”. Despite that factor, the program generates a few laughs. It lacks the satirical anti-showbiz bite of the earlier episodes, but it has some nice bits. Season Five concludes on a low note. Guest stars on The Flintstones rarely work, and James Darren’s feeble appearance doesn’t change that rule. With its connection to the surfing craze of the Sixties, it seems particularly dated, and it lacks many amusing moments. This is a decidedly forgettable show. While I won’t refer to Season Five as a forgettable year, it’s unquestionably the most mediocre batch of Flintstones episodes to date. Unfortunately, I expect that Season Six – the series’ final year – will be worse, but I’ll deal with that when I get there. To be sure, there’s a reasonable amount of humor in Season Five. However, we find fewer real winners and more duds here, a trend that doesn’t bode well for the future. 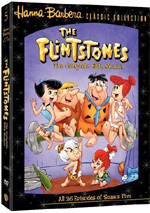 The Flintstones: The Complete Fifth Season appears in an aspect ratio of 1.33:1 on these DVDs; due to those dimensions, the image has not been enhanced for 16X9 televisions. Like the four prior releases, some episodes looked great while others were decidedly flawed. I still thought the majority were quite good for shows made more than 40 years ago. Once again, print defects caused the majority of my complaints. The episodes featured a mix of problems like lines, blotches, specks, grit and other marks. Grain was prominent on occasion. Some episodes suffered from few defects, while others were noticeably messier. At times I thought the problems stemmed from poor clean-up work, but I felt the majority were related to actual source concerns. Otherwise, the shows seemed attractive. Sharpness always looked good. Softness was marginal at most, as the shows were consistently crisp and detailed. No significant issues with jagged edges or shimmering occurred, and I discerned few signs of edge enhancement. As in the past, colors looked solid. The dirtiness of the prints occasionally made them a little subdued, but the hues usually appeared lively and dynamic. Blacks were deep and dense, while shadows were smooth and clear. These shows suffered from some age-related issues, but I usually thought they were quite attractive. Remember that the quality could be rather up and down, however. For instance, some episodes looked absolutely terrific. “Hercurock” stood out in that regard; except for a few minor splotches, it presented stellar visuals. Other shows were fairly ugly. “Fred’s Flying Lesson” suffered from a rough digital look and lots of grain, while “Fred’s Second Car” showed thin lines that often danced around the screen. I liked enough of the shows to merit the “B” rating, but don’t expect consistency. On the other hand, Season Five offered the same kind of monaural soundtrack found on the prior sets. Speech varied. At times the lines sounded surprisingly warm and natural, but other episodes gave us edgy, crackling dialogue. I’d say this was a 50/50 split between good and bad. Effects suffered from only a little distortion, but they also lacked much range. Those elements were consistently thin and reedy. Music showed the same sort of pinched dynamics and failed to come across as robust or vivid. Although the audio was never very good, it remained acceptable given the age of the material. If the dialogue sounded less rough, however, the soundtrack could have earned a grade above a “C”. All of this package’s extras come on Side Two of DVD Four. We begin with a featurette called The Gruesomes’ Road to Bedrock. This piece lasts eight minutes, 25 seconds and looks at the creation of the Gruesomes. We hear from writer/animation historian Earl Kress as he discusses the development of those characters. We see predecessors to the Gruesomes and how these grew into the personalities on The Flintstones. The show views their visual presentation and voice design. I wish we heard the original audio for the old cartoons instead of Kress’s impersonations, but he nonetheless makes this a tight look at how the Gruesomes wound up on the series. A four-minute and two-second A Stone Age Parenting Guide shows up next. This offers a tongue in cheek tutorial about how to take care of kids. Actually, despite its comedic bent, it actually provides some pretty good advice. I’d hope parents would rely on more detailed parenting sources than an animated featurette, but they could do worse. 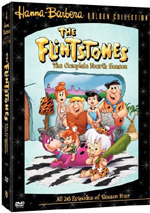 Gemstones: Flintstones Rarities Unearthed fills four minutes and 30 seconds. Kress introduces this piece as we move to some old Flintstones commercials for Welch’s products. We also hear a few comments from creators Joe Barbera and Bill Hanna as they chat about the development of the series and characters. Those elements are reasonably interesting, but the ads are the most fun part of this piece. Finally, we get a few Trailers. This area includes ads for Kid Easter, Scooby-Doo/Dynomutt Hour, The Flintstones, Justice League and Batman Beyond. Each successive year of The Flintstones includes fewer strong shows and more bland to poor ones. Season Five has more than a few good moments but remains pretty lackluster overall. The DVDs present picture and audio that remain consistent with prior releases; that means inconsistent but good visuals along with acceptable sound. The extras are nothing special. As a diehard fan, I’m happy to own this set, but I can’t recommend it to those with a more casual interest in The Flintstones.